Mosul, Iraq slides toward death. The clinics are full of injured and now whenever one hears airplanes, explosions are next as bombs fall. Bombs fall 14 times each day. 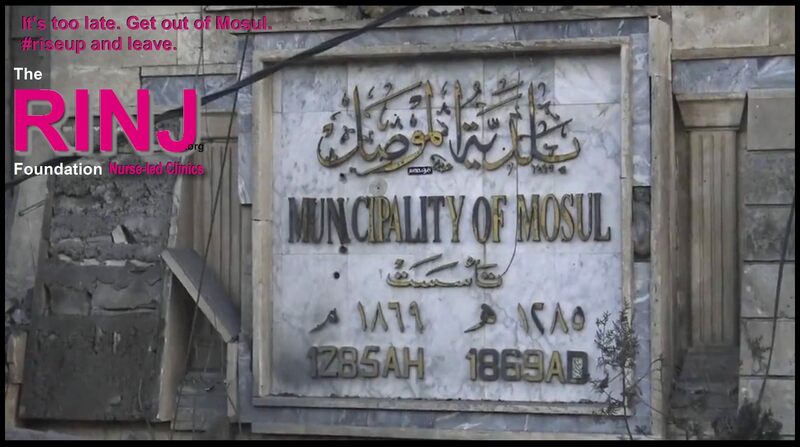 There are few exclusive military targets in Mosul because the salafi-jihadi militants are away war-fighting and those ‘jihadists’ left in the downtown are walking wounded outpatients or citizen soldiers enlisted as guards and checkpoint marshals. Dealing with the Daesh propensity to use human shields as did Saddam Hussein, is not an excuse to raise the bar on the number of “acceptable civilian deaths per target”. You are supposed to be the “good guys”. Don’t kill civilians. You started out on the right foot and then decided in Paris to be like ‪#‎IS‬. The governments of the world need to start protecting the children and their families from this scourge of extremely violent fundamentalism, not killing them. The global community must not accept the American formula for citizen murder vs target value. That sounds like those Iraqi Government officials who don’t think twice about murdering Sunni civilians. No innocent civilian casualty is acceptable. Notwithstanding the fact that the Islamic State has many hard-core members dressed in street clothes and performing significant work to contribute to Daesh criminal activities, there are innocent civilians being killed in large numbers in Mosul. The ‘liberators’ are killing more law-abiding Mosul citizens than does Daesh. On the 20th of January, the coalition members met in Paris to talk about carpet bombing Mosul’s 750-650,000 population among other things. They need to now hear the voices of Mosul say, “STOP”. Bringing this fight to the salafi jihadists where they are making war is the correct way ahead. Attacks against fighting elements away from the cities has been effective. Killing civilians is not. Bombing the civilians in Mosul requires accountability. So far that accountability has been dodged with lies, blackmail, economic extortion and threats. Destroying the cities Daesh has occupied is a war crime. Kobane, Tikrit, Ramadi and all the small towns around them that have been reduced to rubble killing tens of thousands of civilians is on the ‘Coalition’. Declaring that Daesh kills civilians too does not mitigate the war crimes being committed by the so-called “good guys”.